I used to be really good at finishing series, but now that I have less time than I would like to be able to read, it can be hard to finish a series. Some series though, I have no excuse to not finishing other than I just didn’t pick up the second book for whatever reason! Anyways, here are a few series I haven’t finished but do plan to. When I read the first book in this duology, I mostly skimmed it and didn’t really appreciate or understand what was going on…I feel like I had really high expectations for the book because of the hype, but also wasn’t in the mood to read it at the time so I didn’t love it like everyone else did and does. I do have the second book, Crooked Kingdom though, so I would really like to re read Six of Crows and then jump into Crooked Kingdom! I know I will like it once I actually read it, but when will that be? Hopefully soon. The third book for this trilogy is actually coming out in a few days, but sadly I still haven’t read the second book…I love Rick Riordan, and have made that clear on this blog, but I honestly didn’t love this series as much as his others. That is probably the main reason I didn’t read the next book once I got it, but I would really like to give it a second chance. Sadly, I would have to re read the first book which would take up more time, but maybe once the third book comes out I will just binge the trilogy. Yeah, that sounds like a good idea. I know, I know, I am just not up to date with all of the Rick Riordan books! He just comes out with too many books in a year and once you fall behind…well good luck. Anyways, this was another new series by him that I didn’t absolutely adore. I did like it, but I feel like I need to give the first book a re read before jumping into the second one. It is possible that I compared it too much to the Percy Jackson series or the Heroes of Olympus series which is why I didn’t like it as much as I hoped. Hopefully that is the case because I know it is a series a lot of people enjoy! This is a really interesting and complex series that includes one of my favourite things, Greek mythology, which is the main reason I picked it up. I really enjoyed the first book and was looking forward to the second book. However, it was a new release which meant I had to wait an entire year before being able to purchase the second book, Empire of Dust. By then I wasn’t as excited because I completely forgot what happened it the book! So yeah, another re read to add to my never ending list because I really did like the characters and story line. Books I Want to Become Movies! There are a lot of books that are movies that I wish weren’t, but there are also a lot books that aren’t movies that I wish were. Here is the list of all the books I wish were movies! Six of Crows by Leigh Bardugo – Six of Crows is an epic story about a group of misfits who set out to complete an impossible task. This book would make a fantastic movie because of its never ending amount of action and is just filled with scenes that will blow you away! If it is done right, I could easily see this becoming one of my favourite movies or TV shows. Since You’ve Been Gone by Morgan Matson – The reason I would love for this book to become a movie is because there is a sort of scavenger hunt that goes on throughout this book and if it is entertaining to read, I think it would even more in a movie! Since You’ve Been Gone is about a girl named Emily who’s best friend, Sloane disappears as the summer begins, leaving behind a bucket list for Emily to complete that summer. Emily sets off to complete this list along with a few new friends, in hope that it will lead her to Sloane and the answers to her disappearance. This is a very fun, light, summery book that I think a lot of people would enjoy on the screen so please, make this amazing book into a movie! Obsidian by Jennifer L Armentrout – I don’t understand why they haven’t made this book into a movie because it is definitely movie material. It has a hot male protagonist, a good climax, some side action, romance and awesome friendships! This book definitely reminds me of the TV show Roswell so if that is on the screen why isn’t this? Obsidian is about a girl named Katy who after the death of her father, moves to small town with her mother for a fresh start. There, she moves next to two odd and mysterious twins named Dee and Damon Black and after being sucked into their crazy world, her life is flipped upside down. It is a really fast paced book that should be made into a movie pronto. To All the Boys I’ve Loved Before by Jenny Han – This would make a great rom-com and I would definitely watch it. To All the Boys I’ve Loved Before is about a girl named Lara Jean, who after her secret love letters to all the boys she has loved before get mysteriously sent out, she finds herself digging a deep hole of lies to prevent her current love from knowing the truth about how she feels. This is a really quirky, cute and funny book that I think would make a very entertaining movie. Throne of Glass by Sarah J Maas – This would be an epic movie, and I know that it has been optioned for a TV show but that has happened yet so I can still put it on this list. Throne of Glass follows this kickass assassin named Celaena Sardothian who enters a competition where you fight to the death to become the king’s personal assassin. This book has a lot of action and is a very gripping read. It would make a killer movie that I honestly think would do really well. Those are some books I think would make great movies and I hope you enjoyed. Sorry about no not posting anything yesterday, stuff came up! Anyways don’t forget to check out my last blog post: Camp NaNoWriMo Prep #1 and also comment below any other books you think would make good movies. Series I Need to Finish! I am pretty good about finishing series, trilogies and duologies when I start them, but there a few that I for some unknown reason haven’t finished. 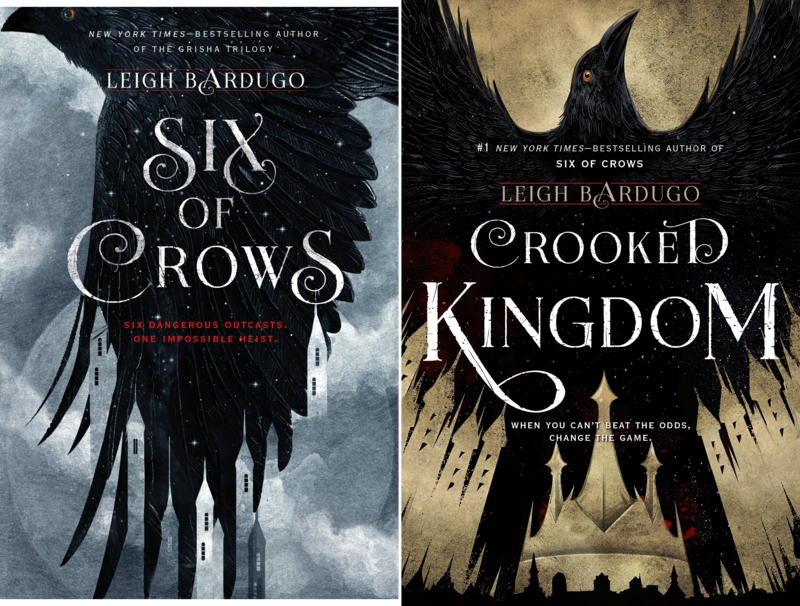 Six of Crows duology by Leigh Bardugo – I have read the first book, Six of Crows and thought it was a pretty amazing book yet I still haven’t finished the final book, Crooked Kingdom. The books is just sitting on my shelf, waiting for me to read it and hopefully I will get to it this year! Throne of Glass series by Sarah J Maas – I really enjoyed reading the first book in this series, Throne of Glass and even the second book, Crown of Midnight, but for some reason it took me FOREVER to finish Heir of Fire and even then, I didn’t enjoy it as much as I hoped. The sixth and final book is coming out this year and at this point I don’t know when I am going to continue on with this series. 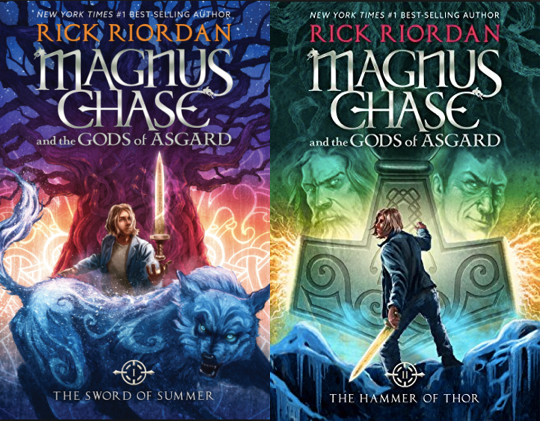 Magnus Chase and the Gods of Asgard series by Rick Riordan – There is only two books out at the moment and I have both, but still haven’t got around to reading this second one, Hammer of Thor. I really want to read it though because I loved Sword of Summer! Is was witty and such a fun and fast paced read so I hope I get to the next book in the next few months. Kiss of Deception trilogy by Mary E. Pearson – I read Kiss of Deception either two or one years ago and I liked it a lot. It was very action packed, and I also really enjoyed reading in all of our characters POV which is rare for me when there are multiple. The final book came out last year but I still need to catch up and read the second one, Heart of Betrayal! Those are the 4 main series that I haven’t finished but really want to and I hope you enjoyed! Don’t forget to check out my last blog post: Reading Update! I know we still have 11 days of January, but I love making my TBR’s for the following months…even if I don’t always stick too them 100%. Glass Sword by Victoria Aveyard – I have yet to read the 2nd book in this series and the 3rd book is coming out in February so I need to read it ASAP! I really enjoyed Red Queen and am really hoping that Glass Sword is just as good. Red Queen follows a girl named Mare who lives in a world where society is divided by the colour of your blood, red or silver. Red bloods are the plain and ordinary while silver bloods have special powers. But when Mare, who is a red blood displays the abilities of a silver, she is forced to pretend she is someone she isn’t to please the King and Queen. Crooked Kingdom by Leigh Bardugo – I read the 1st book, Six of Crows in the summer and thought it was really interesting and amazing so I am super pumped to dive into the 2nd and final book in this duology. I recommend this duology to anyone who loves fantasy and an epic cast of characters! Six of Crows is about a group of people who are sent on a mission to complete a crazy and impossible task and it gets so insane! Fangirl by Rainbow Rowell – It has been a year since I re read this book so I want to give it a another read very, very soon! I love Fangirl because it is so relatable and so adorable that I don’t understand how you could not like it. Fangirl follows Cath who is going into her first year of college with her twin sister, Wren. But unlike Wren, Cath is very closed off and shy and would rather stick to her sister’s side throughout college. But when Cath meets her roommate and her friend, Levi, Cath manages to break out of her bubble a little bit and things get interesting. Anna and the French Kiss by Stephanie Perkins – I always fly through this book and cannot wait to re read it after a long while. Anna and the French Kiss is about an American girl named Anna who is sent off to a boarding school in Paris for her senior year of high school. There, she meets a group of close knit friends, and one of them happens to be a gorgeous Parisian boy named Etienne St.Clair. This book is filled with romantic, hilarious and heart breaking moments that any contemporary lover will adore! Those are all the books I would like to read in the month of February and I hope you enjoyed! I bought a LOT of books this month so sit tight because this is going to be a lengthy post. I won’t go into much detail about each books but I will briefly summarize each of them because their synopsis’s have me so excited to read them! To All the Boys I’ve Loved Before by Jenny Han – I have already read this book, as some of you may know, and loved it so I just had to buy my very own copy. To All the Boys I’ve Loved Before is a contemporary following a high school girl named Lara Jean who ever since she was young, has written a goodbye love letter to all the boys she had loved before. One day though, they mysteriously all get sent out and she finds herself digging a deep hole as she tries to cover up her feelings about her sister’s boyfriend, who also received a letter. I love this book and hope everyone has the chance to read it at some point! I’ll Give You the Sun by Jandy Nelson – I also read this book already and just needed my own copy so I could read it whenever. I’ll Give You the Sun is also a contemporary about 2 twins, Noah and June who after being so close for so long, begin to drift apart after several different life changing events occur. This book is very raw and real and it is amazing! Tales of the Shadowhunter Academy by Cassandra Clare – I have been waiting for the bind up of these novellas for so long now and I cannot wait to devour them! These novellas take place right after the events of City of Heavenly Fire and follows Simon as he starts training at Shadowhunter Academy. I am so excited to continue reading it, because I did start it earlier this month but put it down, but I am just itching to continue on with it. The Lord of the Rings: The Fellowship of the Ring by J.R. Tolkein – I actually got this book for free because I attended this write in writing contest and received this book which I am happy to have on my shelf. I have watched all the movies but haven’t got a chance to read or at least try reading the books yet. Crooked Kingdom by Leigh Bardugo – I really loved Six of Crows by Leigh Bardugo which follows a unusual group of people who are on the mission to complete an impossible task. It is very action packed and just full of amazingness and I cannot wait to read the second and final book to see what happens! A Torch Against the Night by Sabaa Tahir – Again, An Ember in the Ashes completely blew me away so I can only hope that the second one is just as good. The first book is about a girl named Laia who after she witnesses her brother being taken away by the government, sets out to save him. I am so, so excited to read Torch and want to get to it early next year. Last Sacrifice by Richelle Mead – I have been slowly accumulating this series and now have the complete set! The Vampire Academy series follows Rose Hathaway who is part of a race that protects Moroi (vampires) like her best friend Lissa Dragomir. We follow the 2 of them as they attend school while trying to survive from the dangers outside and inside their school. I love Vampire Academy and cannot wait to re read the whole series! The Wrath and the Dawn by Renee Adieh – I have heard great things about this book and the plot just sounds so interesting so I cannot wait to jump right into it. This book is about a girl named Shahrzad who volunteers to be the bride of a prince who every night, takes a new wife only for her to mysteriously be killed by the morning. Shahrzad volunteers in hope of avenging her friend who was the prince’s previous bride but she soon realizes things are much more complex than she thought. Ruby Red by Kerstin Gier – I have raved about this book on my blog before because it has time travel and is AMAZING. Ruby Red is about a girl named Gwen who is from a family of time travellers who every generation another is “blessed” with the gift of time traveling. Gwen’s entire family believes it is her cousin who possesses the gift but things get flipped upside down when Gwen finds herself travelling through time instead. Perks of Being a Wallflower by Stephen Chbosky – This story is so real and heart wrenching and I am so happy to be able to read it whenever. Perks follows Charlie, a boy who suffers from different mental issues all concerning his Aunt Helen who died when he was young. By everyone, he is looked upon as odd and weird but in his first year of high school meets a group of seniors who let him in. This book is so moving and needs to be read by everyone. Those are all of the books I purchased this month and I cannot wait to read all of them! Don’t forget to check out my last blog post: December 2016 Movie Reviews! Empire of Storms by Sarah J Maas – This FINAL book to the Throne of Glass series is coming out on September 6th of this year…I cannot believe it honestly. The Throne of Glass series is so epic and even though I haven’t read the 4th book, Queen of Shadows, I am still super excited for this conclusion to the series! Crooked Kingdom by Leigh Bardugo – This is the sequel to Six of Crows which by the way was a FANTASTIC book that I loved so much so as you can tell I am so pumped for the second book! Leigh Bardugo, like Sarah J Maas, has such a beautiful writing style that I simply devour. Cannot wait for September 27th which is when this book will be released into our hands! Miss Peregrine’s Home for Peculiar Children Movie!!! I am sooo excited for this movie just because the book was so interesting and unique and I am curious to see how they portray that on the screen! This movie hits the big screen on September 30th and I know for a fact I will be one of the people lining up to see this most likely amazing movie! I cannot wait for June because it means the end of school and more reading time! I don’t have that hard of exams this year so I am still hoping to read a good amount of books by the end of this month. My reading challenge is to at least read 50 books this year and by the end of June I should have read 25 and I am 22 so I think I can make it! Anyways here is my June TBR! Shadow Kiss by Richelle Mead is the first book I am hoping to finish in June because it is my current read. I am about halfway done and I am really, really liking it. 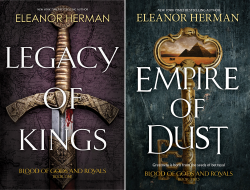 The first 2 books in this series were a tiny bit slow for me but the story is really picking up the pace in the third one and I am very happy about that! If you want a more detailed summary of this series you can check out my last post: Series to Binge Read, because I talk about it in there. A Court of Thorns and Roses by Sarah J Maas is a book I really want to finish this month because it has been on my shelf forever. I am not the biggest high fantasy lover but I do love Sarah J Maas’s Throne of Glass series so I am hoping to love this equally as much! Saint Anything by Sarah Dessen is another book I have had forever and since it is a contemporary novel it will throw me into a more summery mood hopefully. This book has good reviews on goodreads too so that motivates me to finally pick it up! Six of Crows by Leigh Bardugo is the last book I want to get to by the end of June. I recently bought this book because I have only heard fantastic things so I really want to jump on the bandwagon and love this book as much as every other person on this planet.